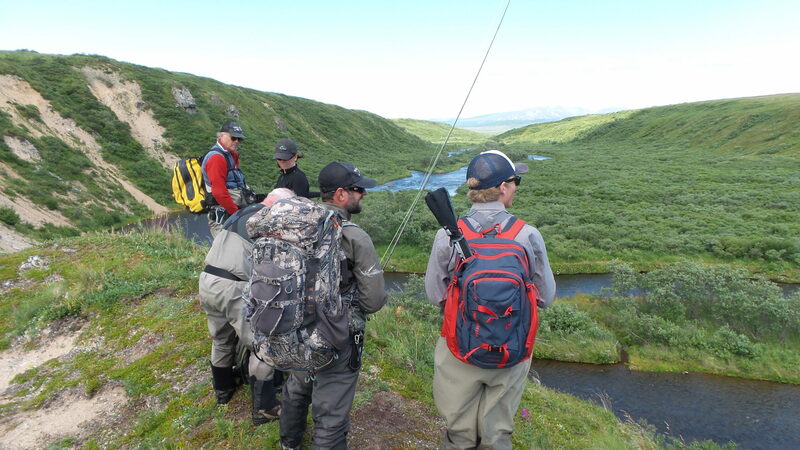 They’re not the Rodney Dangerfields of Alaska’s fly fishing scene, but they don’t take center stage in our angling dreams like sockeye and rainbows. If respect could be earned through sheer numbers, dolly varden would be superstars. These are fish so determined to make it that they refuse to just spawn and die. They spend their lives migrating back and forth from fresh water to salt and offer up angling adventures that rival their trophy cousins. We really admire Salvelinus malma, and here are five reasons why. Yes, dollies and char are close relatives. It’s easy to get them mixed up because they bear a strong physical resemblance, but the two fish part company at the jaw line. Dollies have a much larger kype than char, and that huge hooked lower jaw gives them a distinctive profile. The fork in a char’s tail is deeper, and its spots are larger. Dolly varden sport pink or red bellies while char undercarriages are yellow, orange or gold. We enjoy catching char, but we admire dollies for not complaining about constantly being misidentified. How you fish for dolly varden depends on time of year, location and your personal preferences. Generally speaking, they favor bright colors that resemble salmon eggs. Some anglers swear by white streamers, and others recommend all-black leech patterns. You can catch dollies on sinking tip or floating line with a 12-foot leader. Whatever approach you take, be sure to go with a 4 to 6 weight rod. We promise you’ll share our respect for the ferocious fight in these fish when you go after them with lighter gear. Does spring get you in a fever for Alaskan fly fishing fun? Cast your enthusiasm into an enormous shoal of dolly varden feeding on outgoing fry around our river mouths and estuaries. 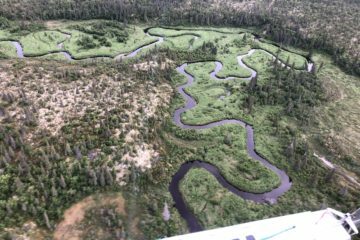 Hit small streams in July, and try to keep your cool in the late summer stalking dollies as they stalk the salmon egg-drop. Are you ready to land a fish so colorful that it looks like its wearing a clown suit? Spawning dolly varden in late August are your ticket to angling heaven. We salute dollies for giving us so many exciting opportunities to fish in so many beautiful settings all across the state. If you’re a fan of Charles Dickens, you may be familiar with a character from his book, “Barnaby Rudge.” That Dolly Varden was fond of wearing brightly colored clothes, but our fish isn’t named after her. In the late 1800s, women routinely sewed their own, and one of the more popular fabrics was a pink, patterned muslim referred to as Dolly Varden. No one’s sure how the name was transferred from dress to fish, but we always appreciate an interesting backstory even when the details are fuzzy. Fuzzy details are one thing, but fuzzy science can be a near-disaster. In 1921, the U.S. Bureau of Fisheries teamed up with the Alaskan Territory and put a bounty on dolly varden. The reasoning was that the fish were taking a big bite out of young salmon populations and threatening commercial and recreational enterprises. The going rate was between 2 and 5 cents per tail, and more than 6 million dollies gave it up before someone came to their senses and stopped the carnage in 1939. You have to admire a fish that could take that kind of a hit and rebound to the numbers we enjoy today. The word elegant doesn’t come to mind when you land a spawning dolly wearing day-glow colors on its belly. The word fun does come to mind when you’re full into fast action on a huge flat of these feisty fish. If you think we’re wrong about dollies and char, come on up here to No See Um, and let’s talk about it. We respect the opinion of every angler who shares our love for fly fishing in Alaska, and we applaud our dolly varden for always keep things lively.